The game that inspired the mod. 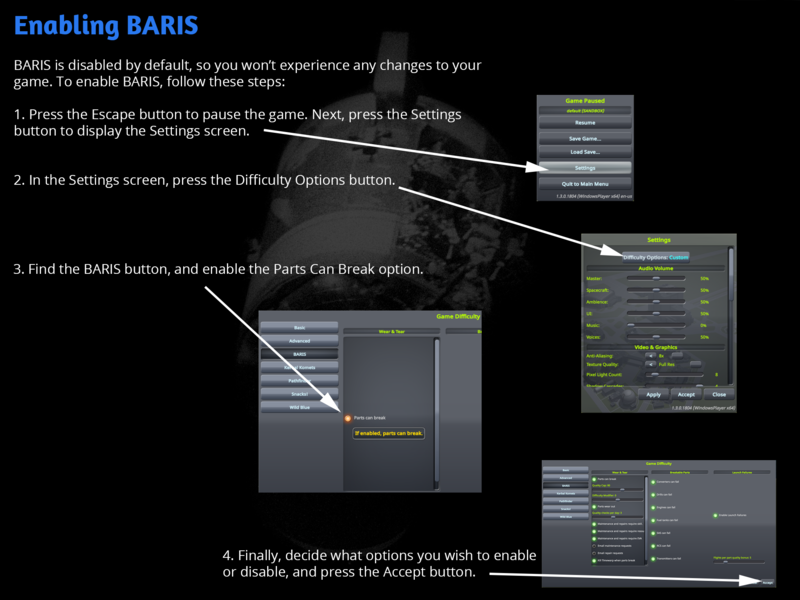 BARIS is highly customizable to suit your play style. Be sure to read up on what you can do before voicing concerns. “Looks like we’re not going to beat Jeb and Bob’s orbital record,” Valentina lamented. “No objections here, boss,” Janchell agreed. Wish you had a reason to replace your old space stations? Have you mastered launches so well that you need a new challenge? Want a monkey wrench thrown into your game play every now and then? Then BARIS is for you! 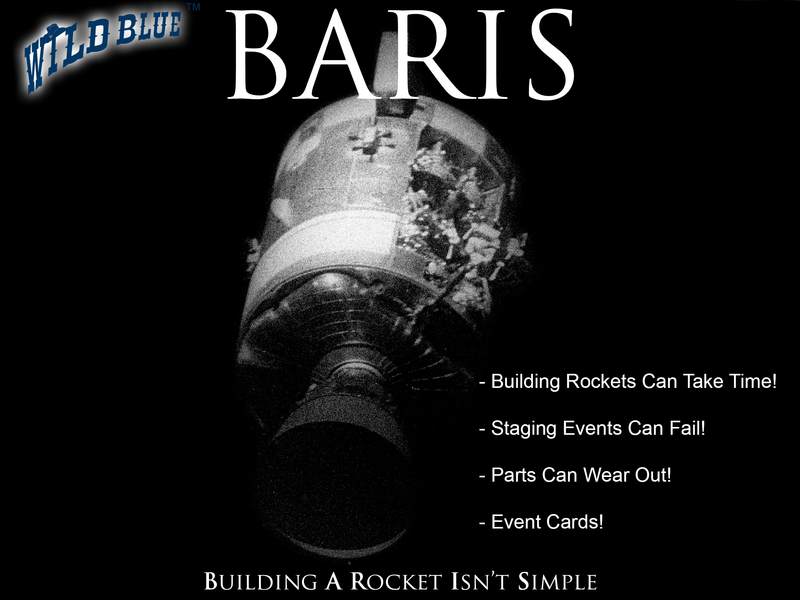 Building A Rocket Isn't Simple (BARIS) is designed to add more challenge to the game by making part functionality break- engines can fail, tanks can leak, and so on. The early game can be rough just like early spaceflight was in our world. 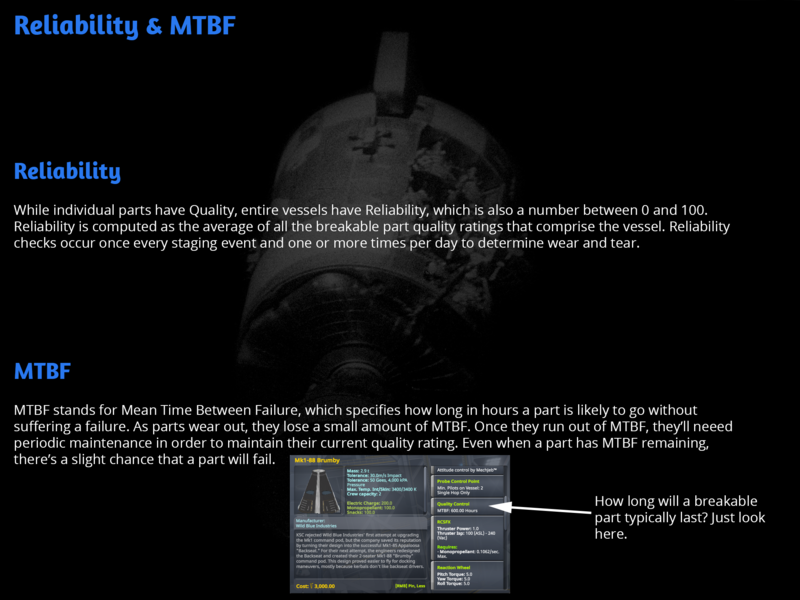 The intent is for players to take the time to build up the part quality and Mean Time Between Failures (MTBF), either through flight experience, the Test Bench, or both. Don't expect to be able to fly off into interplanetary space at the start; that's something you have to build up to. But the more times you launch or test, the more reliable your parts will become. Kermanned spacecraft have the advantage over unkermanned probes and can effect repairs. Yes, the real-world has very high reliability ratings for space probes, but in KSP, since we use the same parts for both kermanned and unkermanned vehicles, a very high reliability will make the game boring. Thus, it's best to design redundancy in your probes and deactivate any part not in use- they'll last longer that way. For long journeys, put your vehicles into hibernation mode- turn off engines, RCS, SAS, drills, any ISRU converters, lock your fuel tank resourcess, and so on. This is similar to how Soyuz spacecraft hibernate to extend their service life after reaching the ISS. Deactivated parts won't break, but their MTBF ratings still degrade, albeit at a much slower pace. Finally, BARIS's default settings might not appeal to everyone, but you can change settings to suit your own play styles, either through the Difficulty settings, the Constants file, or both. Be sure to check both places for customizing BARIS before discussing your challenges on the forums. BARIS is compatible with Kerbal Construction Time and Kerbal Alarm Clock. Disable the option for part types to fail for parts that you think are too mission critical to fail. Lower the number of Reliability checks per day. 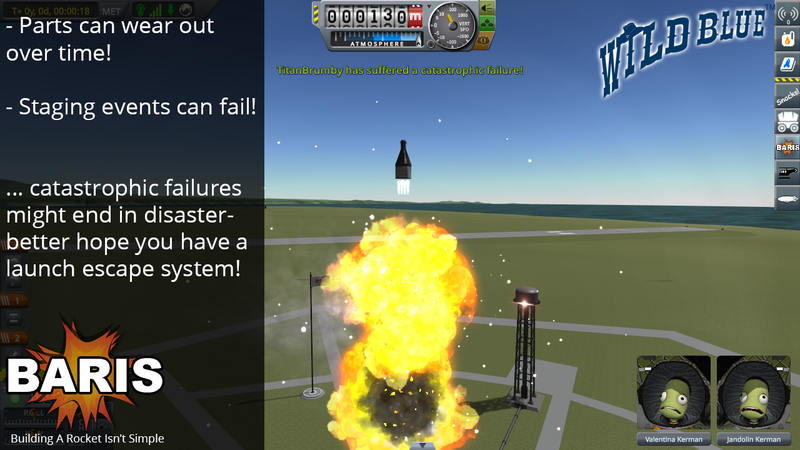 Don't allow parts to explode during launch failures or during post-launch activities. Lower the number of flights it takes to gain flight experience. Conduct static fire tests and/or use the Test Bench to gain flight experience. Disable the option for parts to wear out. 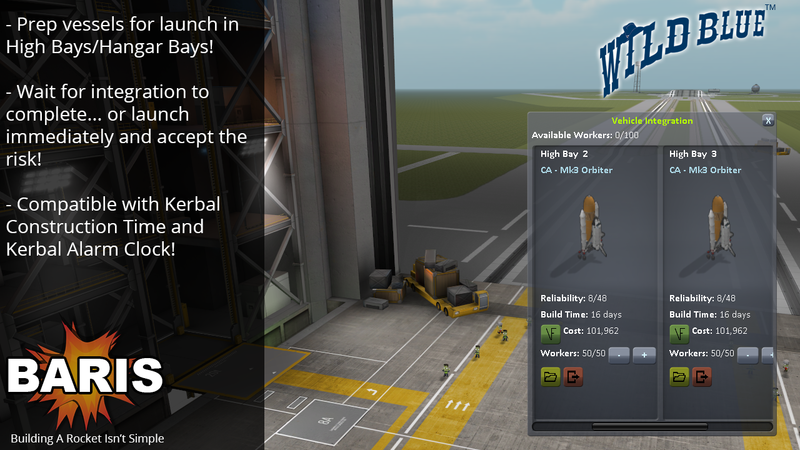 Disable the option for launch failures. Disable the need for skilled repair kerbals, the need for Equipment, and/or the need for an EVA to conduct repairs. Edit the values in the Constants.cfg file and/or the MM_BARIS.cfg file. Special thanks to @JadeOfMaar, @minepagan, @Daelkyr, @rock3tman, @CobaltWolf, @TheRagingIrishman, @ISE, @steedcrugeon @Pak and many others for their feedback and play testing. Thanks guys! Art Assets, including .mu, .mbm, and .dds files but excluding Event Card Images By Squad and AstronautOnVacatin image are copyright 2014-2016 by Michael Billard, All Rights Reserved. Note that Wild Blue Industries is a ficticious entity created for entertainment purposes. 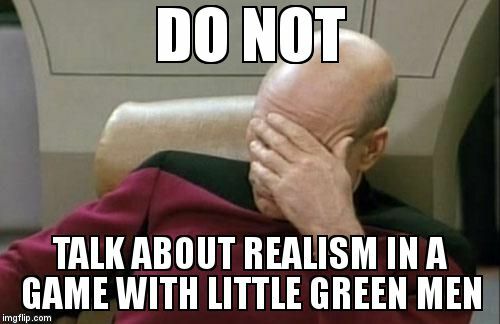 It is in no way meant to represent a real entity. On the top of the OP of course! BARIS is bundled with all WBT mods but is also available separately. @Angel-125 is starting to become like @Nertea or @RoverDude in his amount and quality of mods. And like Roverdude and Nertea, I have downloaded every one of his mods. 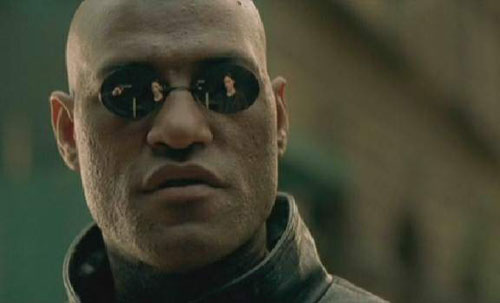 What if I told you, good sir, that Angel has been on that level the entire time. And that you only now realize it? 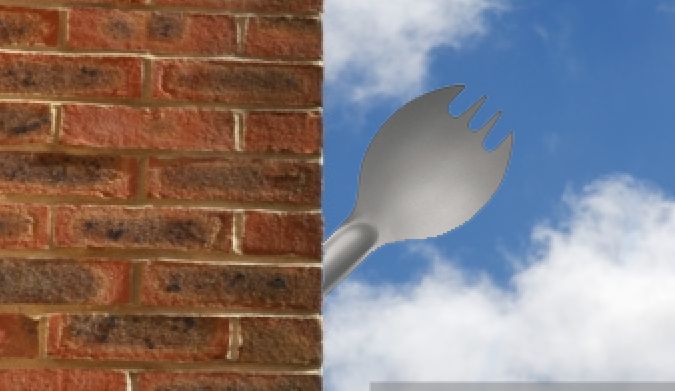 There is a spoon, there is a spoon! 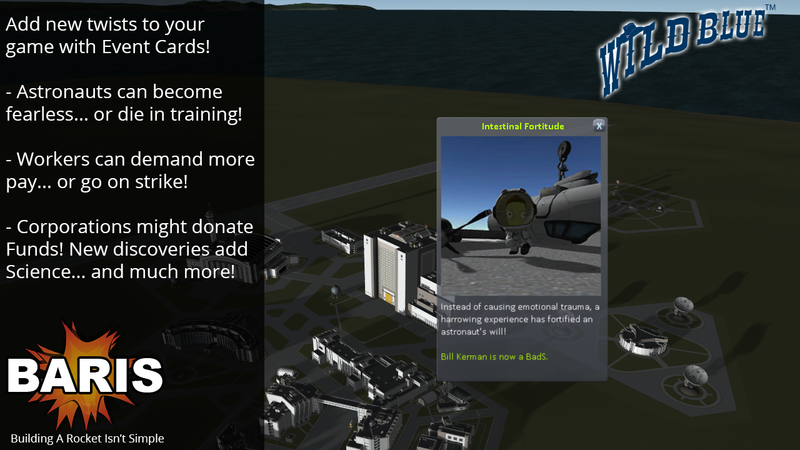 Question: I was sitting at my miner on kerbin getting some cash to fund my space program when I noticed I am getting event cards and my money is dropping. It says one of my crew went missing and there was an accident at a hanger etc. I got about 4 or 5 cards however I never enabled BARIS and my money is going down. Should this be happening when its not enabled? Now it says the fuel tank on one of my satellites has failed and the part highlights red. I double checked my settings and parts can break is not enabled. Kerbals are also being added or removed from my astronaut complex. Was this a new save @Vaga or have you recently updated Pathfinder/Buffalo on an existing save? That should not be happening, are you doing any time warps? You got 4 or 5 event cards, how quickly did that happen? I take the.... (Red and blue, it's a hard decision) red pill! I am doing some time warps. They seem to happen about every 4 or 5 days I think.. Might be every 2 weeks hard to tell in time warp but there are several days between. 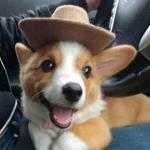 @steedcrugeon This is not a new save its one I have been playing for about 1 or 2 weeks. The recreation steps really help, thanks. I found the issue, I'll have a fix later today. - Fixed issue where Event Cards would happen even when BARIS is disabled. - Updated "Reliability & MTBF" KSPedia page to show where to find a part's MTBF. - Added new KSPedia pages describing how to enable BARIS. Everything seems to be working good so far.